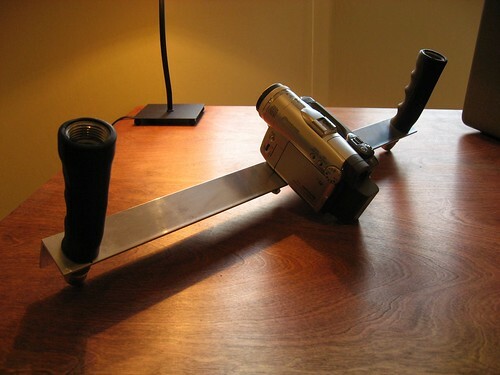 I’ve always wanted to get a proper SteadyCam or a Manfrotto Fig Rig to help stabilize non-tripod shots with my video camera, but both options can be a bit expensive. 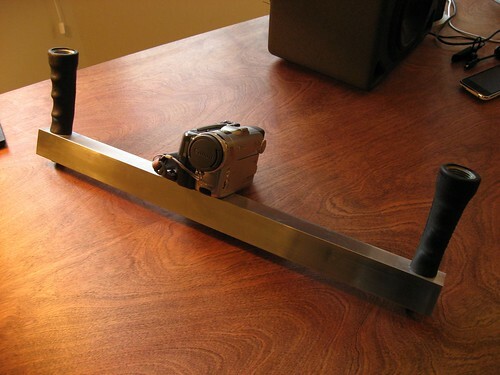 While a SteadyCam tries to isolate vibrations from the cameraman through gimbals and counterweights, the Fig Rig uses two-handed leverage to dampen them. 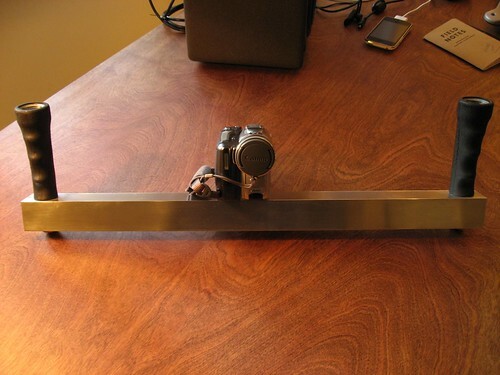 It’s simple, effective, and easy to emulate, so I decided to build my own “DIY Camera Stabilizer”. Before I started, I found a great post on dvxuser.com from someone who made their own stabilizer. His design was so elegant that I decided to try it. He simply used a piece of L-shaped aluminum for a crossbar, and in a brilliant example of genius, used garden hose nozzles for the grips. The genius of the garden hose nozzle is that it includes a rubber grip wrapped around a brass pipe with a threaded end point. 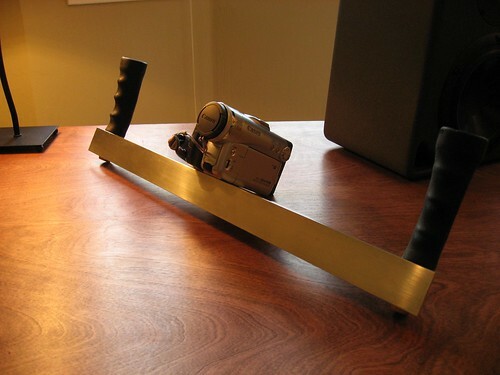 There’s no need to fabricate a custom hand grip! I have a benchtop drill press which made construction simple. I bought two hose nozzles and a length of 1.5 inch x 1.5 inch x 1/8 inch thick L-shaped aluminum bracket at the hardware store. Using a hacksaw, I cut the bracket to 22 inches long, and drilled a hole in the center for a standard 1/4 20 camera mounting bolt. The threaded end on the hose nozzle was a bit more than 5/8 inches wide, so I bought a fat 5/8 inch drill bit, drilled holes 1 inch in from each side for each nozzle, then filed the hole a tad wider until the holder would set in place. I gave it a quick polish and cleaning, and that was that. The finished product is amazingly effective. Videos are very smooth and steady. You can fake some nice crane shots, and by doing the “groucho walk,” you can get nice dolly-like SteadyCam flying. I’ll post some videos after I practice a little more.